Breakfast: EGGS! And coffee with almond milk. 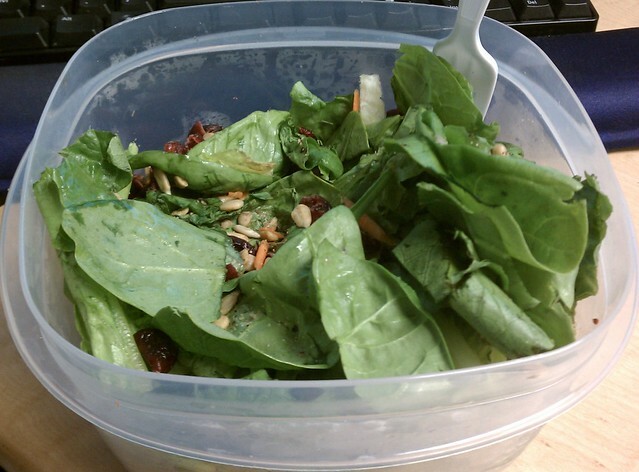 Lunch: Salad from home, as seen above, with romaine and spinach, salt, pepper, sunflower seeds, and craisins. This was actually a delicious combination, and I treated the craisins as I do the marshmallows when I’m eating a bowl of Lucky Charms (or, at least, how I used to, gelatin blah blah blah): I spaced them out so that I’d have a little bit of sweet/tart craisin with each bite of salty, savory salad. Yum. Dinner: Masala! I went to dish with my friend Heather about nursing (school+work), and I got pakora and vegan coconut curry. I cut up the pakora into smaller pieces, and then drizzled the curry over the top, using it as a sub for the rice that I usually use as a filler. I did a little bit of research before going to Masala, and found that pakora are breaded in gram flour, which is actually made from ground chickpeas. Not a grain! WOO! So, that’ll be good for future reference, when I’m trying to take it easy on grains, especially if I end up hitting Masala more than once in a week (not so unlikely). I was still feeling irrationally angry at everything today, which isn’t a nice feeling, especially when I can rationally look at myself and wonder WTF is wrong with me that I’m feeling that way. I hope it gets better tomorrow. The calorie count for today came in at approximately 1,171, which is still too low, but getting better.